This year, the Nigeria Higher Education Foundation (NHEF) is inserting itself in relevant conversations going on in Nigeria, and globally. Through the 3rd edition of the Annual Essay Competition, the NHEF is giving the Nigerian youth a voice and a platform to participate in these socially-relevant debates. * NHEF Partner Universities include Ahmadu Bello University, Bayero University, University of Ibadan, University of Nigeria, Nsukka and the University of Port Harcourt. • Each essay must include a Title Page, a Bibliography and a scanned copy of the contestant’s current student ID. The student’s registration ID# must appear at the header section of each page. • All entries must be submitted via e-mail to essay@thenhef.org by 11:59 p.m. (WAT) on May 15th , 2017. Students are encouraged to study rules on how to avoid plagiarism as the essays will be checked for intellectual authenticity. This link contains a helpful guide. 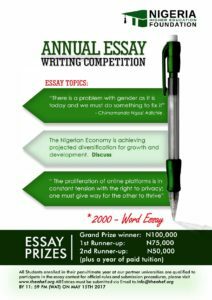 Grand prize winner of the 2017 Essay Competition will be awarded a cash prize of N100,000 with a year of paid tuition. First runner-up will be awarded a cash prize of N75,000 with a year of paid tuition. Second runner-up will be awarded N50,000 with a year of paid tuition.